The best of both worlds – all for the price of just one card. With the Diners Club card, your staff will automatically earn 1 award mile for every CHF 1 spent. Diners Club cardholders also enjoy exclusive offers, such as discounted entrance to more than 800 Diners Club Airport Lounges around the world, top-class insurance benefits, and much more. The Miles & More Gold Business Visa or Mastercard® card is the perfect complement to these benefits. Apply now for the Miles & More cards with the combo offer. The ideal combination on business trips: enjoy fantastic Diners Club offers and collect Miles & More award miles. With the Cornèrcard Miles & More combo offer, your employees will enjoy the highest level of convenience when using their card for business purchases and collect valuable award miles with every purchase. 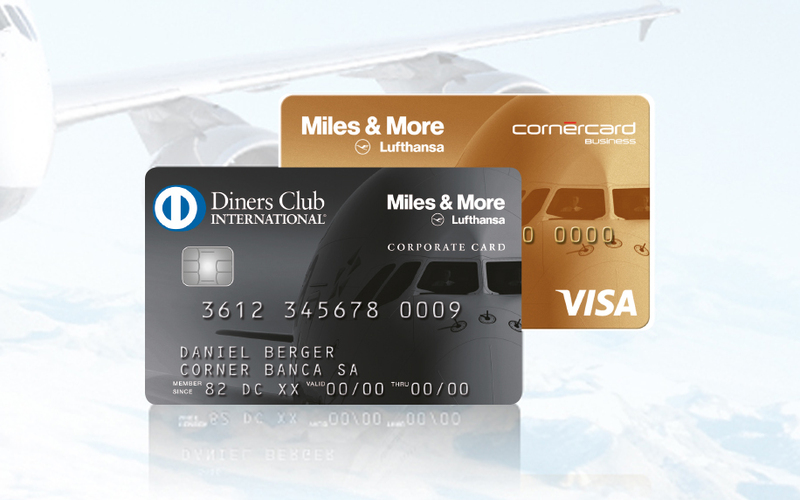 With the miles package included with the card, cardholders now benefit from their Diners Club Miles & More Corporate card in several ways: every time they use their card, one award mile per CHF 1* spent will automatically be credited to their miles account. 10,000 award miles as a welcome gift. 1,000 award miles for annual card expenditure of CHF 10,000 or more, 3,000 award miles for annual card expenditure of CHF 20,000 or more, and 5,000 award miles for annual card expenditure of CHF 30,000 or more. This will be calculated separately for each card. Cardholders who buy airline tickets with their Miles & More Corporate/Business cards will benefit in two ways: they will receive award miles for the tickets according to Miles & More guidelines, and they will also collect extra award miles for paying for the tickets with their card. The Miles & More award miles that are collected can be used to redeem awards, such as flights, flight upgrades and high-quality products. Treat your staff to something truly different: as Diners Club Miles & More Corporate Card card holders they will automatically become Diners Club members and enjoy special benefits – including on business trips. Additional information and benefits can be found under “Benefits”. The superior reporting solution for global companies: Global Vision is the ideal tool for processing expense management data and reports and it enables simple access to travel costs and other expenses. The efficient expense management tool for small and medium-sized companies identifies cost-saving potential and allows for greater transparency and control. * Not included are cash withdrawals, fees including the annual subscription fee, interest payments, games of chance, the use of gambling machines, or the services offered with the card. ** The award miles do not expire if you use your Miles & More Corporate/Business cards at least once a month for payments that attract miles. Further information about mileage expiration can be found at: miles-and-more.com/de/no-mileage-expiration. Relax in a calm atmosphere – at more than 800 Diners Club Airport Lounges around the world. Always on the go: with the E-Account, you can access your card usage and monthly statements online at any time and anywhere.